Our care packs have been designed with much thought and care for that unexpected stay in hospital. Our mission is to bring smiles and joy to your child at a stressful time, no parent wants to see their child in distress and by receiving one of our care packages we hope it changes tears and sadness to laughter and smiles. All of the items in our care packs have either been donated by our very generous sponsors or members of the public. We’re so grateful for the support. 2-4 yr olds - Sticker books, Stickers, Scrap books, Crayons, Puzzles, Ink stamps, Hot wheel cars, Flash cards, Toy Jewellery, Activity books, Reading books, Colouring in pencils & Textas. 5-8 yr olds - Colouring in pencils, Textas, Crayons, Colouring in books, Activity Books, Origami papers, Craft packs, Maze books, Reading books, Hot wheel cars, Purses, Dolls & Flash cards. 9-13 yr olds - Puzzles, Card games, Loom bands, & Mini board games, Lip gloss, Journals, Craft packs, Reading books, Mini Science kits & Comic books. 13-16 yr olds - Mindfulness colouring books, Colouring in pencils, Sharpener, Reading books, Lip gloss, Craft packs, Origami papers, Activity books, Comic books, Card games & Mini board games. We love the support from companies large and small and this donation has come to us as a huge surprise! We have just received 50 of these gorgeous Teddy Bears from Visit Snowy Mountains who are based in Thredbo NSW. They love what we do and the concept behind Smiles2U and wanted to keep that smile on the kids faces with these Teddy Bears. Thank you Gregg and team! We love them! We will be popping these Teddy Bears into the Cuddle Bags for the kids who face a lengthy stay in hospital. Our Essential care packs are filled with the basic necessities as well as some special treats to ensure that they experience some level of comfort and nourishment during an unplanned stay in hospital. Listed below are examples of what goes into the pack. Notebook, Magazine, Crosswords, a Pen, Shampoo, Conditioner, Deoderant, Tea, Coffee, Hand cream, Lip gloss, Mini tissues, Chocolates, Snacks and Muesli Bar. Mindfulness' means paying attention to the present moment. Practising mindfulness can help you cope with every life and deal with tough times. 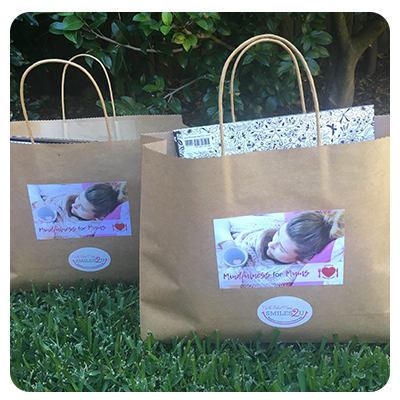 North Shore Mums Smiles2U has created a mindfulness pack for Mums in the RNSH Neonatal Intensive Care Unit. 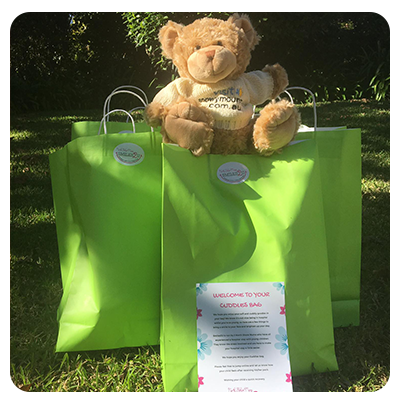 Our goal with this care package is to assist the Mum with some distraction, deliver some comfort and to supply her with some items the Mum can use at home to help with reducing anxiety, stress and promote rest and sleep. 2017 was a year of growth for Smiles2U and we wanted to include a new initiative that would help make a difference. Many of us have been affected by Cancer and the toll it takes on the person suffering. We wanted to create something special for a female patient going through the affects of chemo treatment and having to sit for hours in the infusion units hooked up to machines. With support from local hospitals and friends who have been affected by cancer or have supported a loved one we have created this care pack. Our hope and wish is that you gain some comfort and distraction with these specially chosen items. This care pack includes: Affirmations cards, Nail polish, Mindfulness colouring in book, Notebook, Pens, Chocolate, Bath bomb, Lip balm, Hand cream, Bath milk, Candle, Queasy lollies. We can’t change the present but we can bring comfort and care. 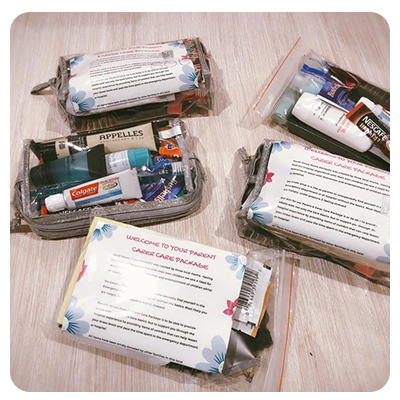 Currently this care pack is at the Day Infusion Unit at the Sydney Adventist Hospital (SAN) and the Oncology Unit at the Macquarie University Hospital. 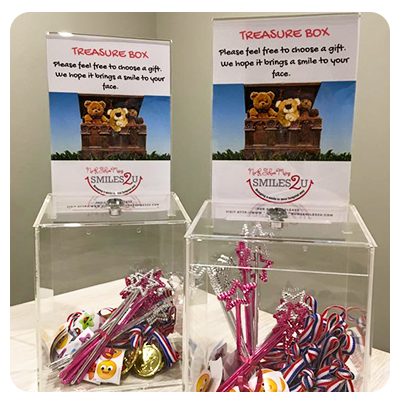 The Treasure box was inspired by a little boy who was given a toy medal for being so brave by one of the Smiles Team members. The Mum messaged us to say he kept that medal on for a week and loved it. He bathed and slept in it. It turned his hospital stay into a more positive experience. So we decided to create these Treasure Boxes for the short stay hospital visits. A sticker and a little gift for bravery. The treasure are to help make lots of children's hospital visits, whether it be for a blood test, scan or stitches, bring a smile to their face at some point during their stay. This year we will be supporting 7 hospitals with gifts for the kids who will be in over the Christmas period, if you would like to buy a gift for a child in hospital. 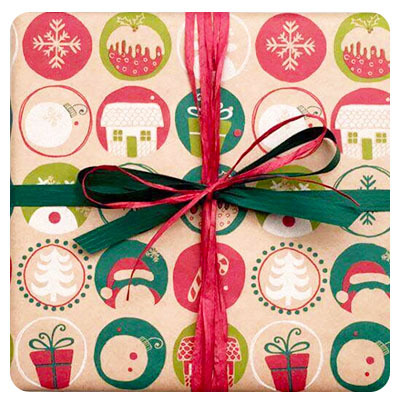 Please "buy" a gift which we will wrap and deliver to one of the local hospitals we support. The treasure chest is filled with toys that are given to a child who has received surgery whilst in hospital. These gifts are bravery awards for being strong and brave for what they have just endured. If you're business is interested in supporting us with this venture please click on the link below.